Bee Specialist has been in business for 35 years. As a young man, owner Ron O’Brien harvested honey from his own bee colonies and sold bee supplies. After several requests to help people remove unwanted bees from house eaves, sheds and birdhouses, he launched Bee Specialist, a company specializing in live bee removal in Los Angeles and Ventura counties. Early on he developed ways to remove bee hives using safe, organic methods before going green was in. 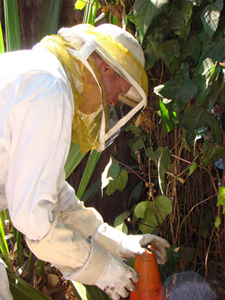 Read about Bee Specialist saving bees HERE.